Hey, it's time to review the new Star Wars, a movie you're probably going to see anyway! As someone who really doesn't hold much affection for the Star Wars franchise, my love of The Force Awakens really shocked me. Not only did it end up making my end of the year 10 Best Movies in 2015, but it also was what I still think of as a pitch perfect blockbuster - one that breathed new life into that universe, introduced nuanced and compelling characters, and looked pretty terrific while doing it. I couldn't have imagined a situation where I found myself caring about where the plight of the Jedi and their ragtag companions could possibly go, but yet somehow JJ Abrams, Kathleen Kennedy and company all pulled it off. In the between time, I had to suffer through Rogue One, but it was okay, because I knew Rian Johnson would be at the other end of that tunnel to cradle me in his bearded embrace. His The Last Jedi, which picks up literally within moments of the end of The Force Awakens, paints a picture of a struggle that never took a breath. The Resistance, led by General Leia, find themselves in the middle of a back and forth with General Hux's First Order. Hux, truly the bitchiest member of this new iteration of the Empire, gets into a humorous bit of dialogue with a solo Poe Dameron scouting just ahead of a charge of bombers who are attempting to lay waste to the First Order's colossal Dreadnought. While this event will set the stage for what drives Poe, Finn, Leia, a few new additions to the cast, and the entire Resistance itself, it's also probably the last time audiences are held subject to the standard light and dark side debate that has populated these films as a rule. It was the accepted line of thinking that the guys dressed in black are bad, and the scrappy underdogs in white, and various lighter shades are the good guys. Well, Mr. Johnson was going to have none of that, as The Last Jedi is a film all about the debate of what lies between those two extremes. Not every character necessarily approaches moral grey tones, but even those characters that are what we deem to be inherently "good" or "bad" are faced with conflicts that drive a question into the morality of their cause. A daring choice for the world's most popular blockbuster series, but when Johnson (who both writes and directs here) centers in directly on that theme, The Last Jedi does something that is all too rare for the Star Wars series: introducing new notions within the sphere of its seemingly impenetrable worldview, and new ways of how we might conceive the two warring factions and the people that have to work for them and the little people who find themselves under their boot heel. But, as a caveat, the further away the filmmaker gets from this novel approach, the less effective the film becomes. This can be seen clearly in the division of narrative between the three major protagonists of The Force Awakens. Each hero from that last outing, Rey, Finn, and Poe are given their own slice of the film within which to work, and it's clear where in each of the three that Johnson's interests chiefly lie. 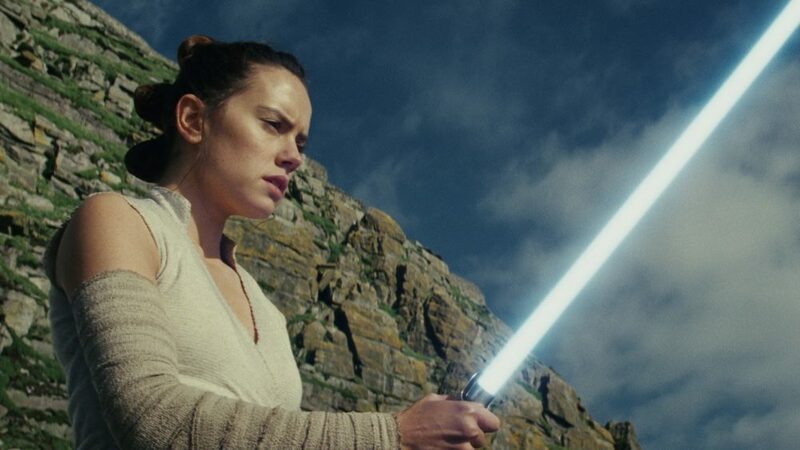 Rey's storyline, the most effective of the trio, finds her making contact with the long-lost Luke Skywalker in an attempt to bring him back into the fold of the Resistance, and in turn determine her own place within it and The Force itself. Additionally, this is where Kylo Ren, the wayward son of the now deceased Han Solo and Leia, is directly involved - and if this series does nothing else, it absolutely, 100%, proves to me that he is the most unique and well-developed character of the Star Wars universe. Here, he is basically the mouth piece for Johnson's vision of this struggle, and every scene he and Rey share outshines everything else that surrounds it. We knew Adam Driver was a compelling and nuanced actor, even before this film began to roll, but the surprise here is just how well Daisy Ridley is able to match Driver's well-known intensity. Luke plays a sort of middle-man between them, and it's not a stretch to say this is surely Mark Hamill's best outing in the role. He's given a good deal of meat to chew on as a bearded, reclusive version of the previous trilogy's central hero. The most welcome element on hand is just how effectively Hamill carves out this elder version of the character and stands separate from any temptation to make him the "Obi Wan" of this entry. From the emotional beats he presents, and the general sense of stubbornness throughout, you can conceivably believe this is the man that Luke grew into. Oscar Isaac's Poe Dameron gets a lot more to work with this time around. Rather than just being the very likable, handsome pilot guy, he's now the Commander of the Resistance fleet and our POV within the machinations of their operating order. Through his story, we spend most of our time with Leia, as well as Lauren Dern's purple-haired Vice Admiral Amilyn Holdo. In this way, Poe's end of the tale works as a counter-point to the ongoing struggle between Hux and Kylo Ren. In both cases, we see the inner-workings of office politics and their respective power struggles. Poe is faced with issues related to the chain of command, especially in times of crisis - there's a not too subtle influence of Battlestar Galactica present here. It is an arc that is mostly effective, though somewhat truncated by its proximity to the least compelling storyline of the film. Which brings us to poor old Finn. Finn, who occupied an exciting space within The Force Awakens (that of the faceless Stormtrooper turned hero), is saddled with what is basically a gigantic fetch-quest and the on-boarding of a new character in Kelly Marie Tran's Rose Tico, a member of the Resistance who volunteers to help him on this side-mission that feels like it lasts 10 years. Not only are the sequences they are involved in the least exciting of the entire affair, but they also are the stretches that rely the most on green screen and iffy special effects, neither of which are Johnson's specialty. One of the troubles here is that Finn basically is static throughout, and he's grafted to what is basically a non-entity in Rose. A character, who in theory, fits right alongside the themes that are being developed in all three storylines to some degree, but the execution of the character is the thing, and Rose never seems to grow beyond "earnest" with a connection between these two that feels rushed to say the least. There's a lot of tell here, and nowhere near enough show. And to briefly get back to the subject of Carrie Fisher, her return here is bittersweet, as her passing last year does indeed echo within every scene she appears. But thankfully, she is the centerpiece of two of The Last Jedi's most touching moments, one that is especially artful and the other overflowing with emotion, striking a nerve in a moment that is sure to choke up audiences. Despite the script's occasional lapses, there is at least some worthwhile study for the cinephiles in the crowd, as the stark contrast between the Abrams approach: with his wide environmental vistas and shots that are mostly at eye-level with his actors vs. that of Johnson who takes a slightly more "up from the ground" viewpoint, with much of the action occurring inside somewhat claustrophobic settings, makes for a unique point of comparison between two very different filmmakers. It's not that I expect much auteur imprint, but it's nice to get a hint of the artist behind the camera, which is apparent in both instances, and likely where a lot of the rewatch value will be found where this reviewer is concerned. Star Wars: The Last Jedi is a tale of one really great "A plot" and character progression, and a pair of solid and undercooked storylines, respectively, that are tied together as a sort-of "B and C plot". The good news is that by the time the movie enters its climatic final moments, it hits a pretty good groove before the credits, though the way it comes together isn't exactly graceful. On the whole, it's an outing that could have done a little more with less, and while Johnson and company are bursting with ideas (some of which defy expectations), they don't all work and the overly bloated running time of 152 minutes is a testament to that fact. The truth is, there's an entire segment of the film that could have been excised completely from the script and not much would have been lost. When it works, it really works, but the fat overwhelms it all too often. Johnson acts as a sort of caretaker to the concepts and characters introduced in 2015, and to his credit, he gets them from one end of the film to the other without any major hiccups (save for Finn); but with that said, I find myself far more enthused to see Abrams pick the baton back up for Episode IX and close out what he started. Oh, and by the way, the Porgs are terrible. But I know you're not going to.